I can attest that local bowling alleys around these here parts offer greasy enchiladas for those patrons with rumbly tummies, but never Asian fare. Certainly not tea pots of hot jasmine tea and family pu pu platters. Evidently it was imperative that all males wear jackets and ties to the bowling alley. And then the jackets came off once they hit the floor. This family could not be having more fun. The helicopter lady in the background could repurpose her ensemble for Saturday’s tennis match as well. Bowling centers provide “attractive nurseries for toddlers”? Have you ever witnessed this to be so? They must have put the kibosh on this well before I was born. 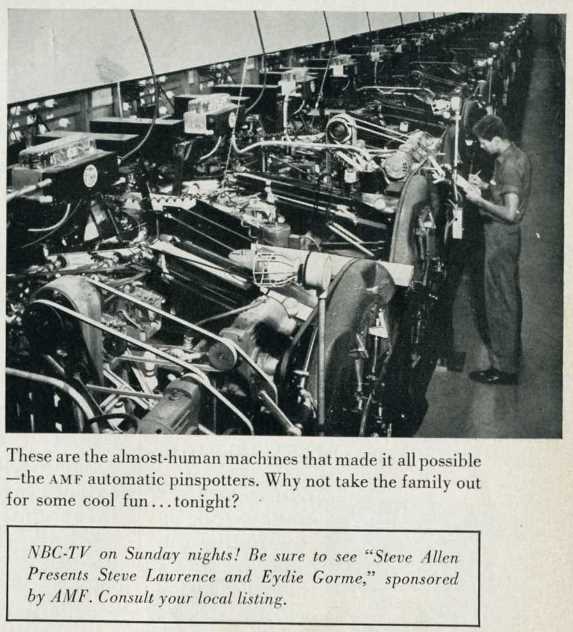 And hey, have you ever seen the inner workings of the “almost-human machines”? Pretty keen. So get out there and do some summer bowling before it’s too late! MUST. GO. BOWLING. . . .
Oh, one just opened up near our city. I wonder if it has a bowling alley, too? How does that have anything to do with Bass Pro? I confirmed it. A girl at church says she applied to work in the bowling alley there. We both have to check it out! I’ll let you know once we give it a try. My bowling skills are less than attractive, but it should be fun! Interesting history Kerbey. AMF was an impressive member of the military-industrial complex and they were a huge conglomerate after WW2. Their down fall was that they tried to be too many things to too many customers. They actually built Iran and Pakistan’s original nuclear power plants. 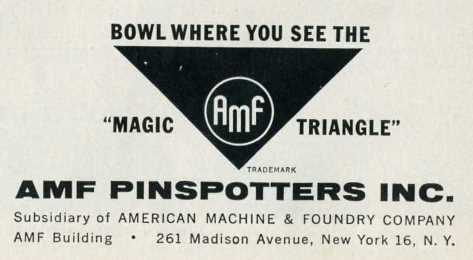 They tried to make bowling into the nation’s favorite pastime as they were the leading producers of pins, pin setters. bowling balls and eventually the largest chain of bowling alleys in the world. Your confusion over the focus of their advertising and the use of bowling alleys as Asian restaurants, Child-care centers, etc is a sure indicator about the public’s confusion over the purpose of their centers. AMF actually owned Haley Davidson at one point and even built motor-homes. But like a lot of their contemporary conglomerates, they failed miserably at focus and excellence. This lack of control resulted in suffering quality and poor ability to compete. The only conglomerate from that era that survived was GE. And they did this by making leadership their core competence while the others, such as AMF failed by making subject matter experts (SMEs) their focus. Interesting story Kerbey. Anyway, the confusion in their advertising was indicative of the confusion in their focus that eventually lead to their failure. Cool post. You pinned it. Ha! No, you pinned it because you are the History King. I know what GE is; they bring good things to life. They succeeded in putting their slogan in my head. It makes me sad that bowling (like airplanes) looked so fun back then. I never see such opulence now. Even trailer parks looked glamorous in the 50s! I would think you couldn’t make a lot of money making pins, as pins should last forever. And bowling balls. Generations of dead people’s fingers have probably been in all the bowling balls today. 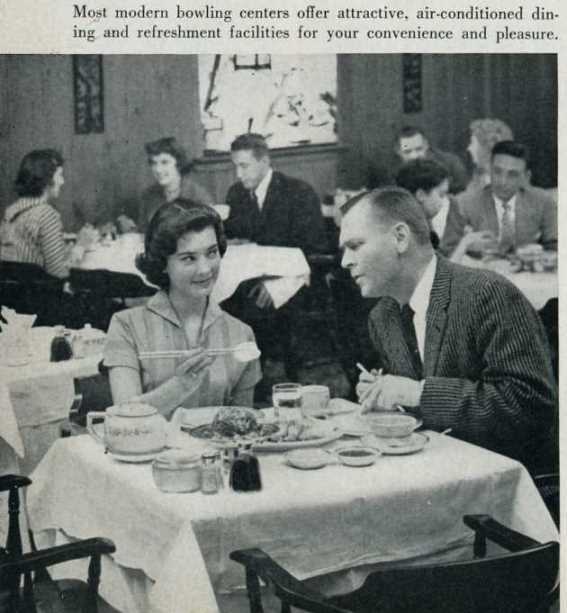 Well I have only been bowling a few times but I have been around more than a few bowling alley lounges and I have never seen any so fancy. It just shows that I never moved with the right class of people. This makes me miss my junior bowling leagues when I was growing up, Kerbey. Jeez, even in the 1970s as a teen, we called them bowling alleys, they served hot dogs and burgers and fries at a diner counter in the middle, and no woman who looked like Jackie O was rolling on the lane over. LOL at Jackie O. What, no long pink gloves while bowling? They’d get so soiled from the lane oil, Kerbey! That’s pretty fancy! 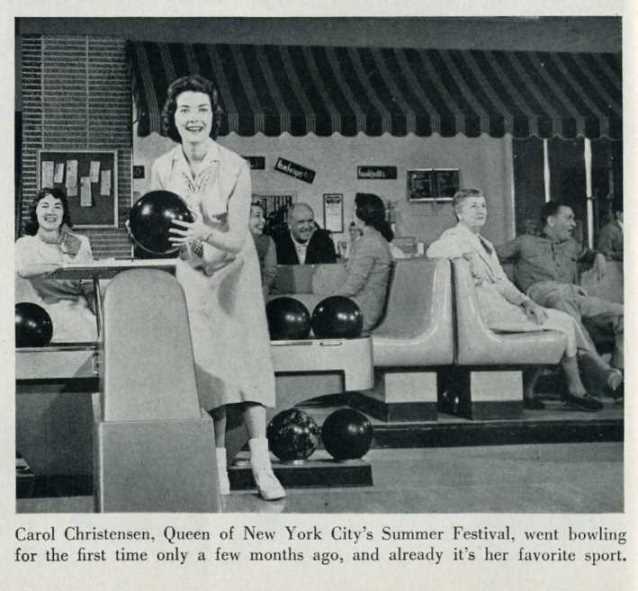 They don’t make bowling alleys like they used to! That’s pretty fancy! 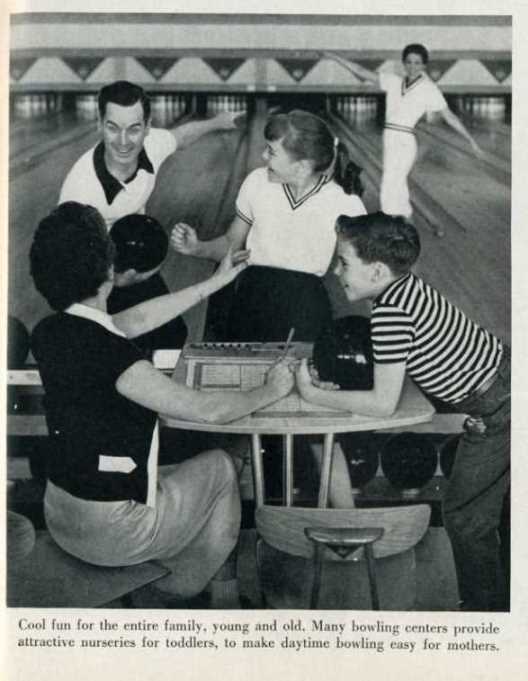 They definitely don’t make bowling alleys like they used to! I don’t recall that discussion but I think I would have liked your mom. I had dreams of being born in the 30s and being a 50s housewife in heels and pearls and dresses. Yes, it might hurt the arches of my feet, but who can deny the power of a flouncy crinoline dress? I may have talked about pedal pushers with someone else who had an old fashioned bicycle female rider photo on their post, Kerbey. This is why those short length pants came about so they would not get stick in the pedals. You sound like someone who would have fit in that style. Have you ever bought 50’s as a costume or been in a play? I was usually backstage helping with makeup or costumes. Nope, just rented a 50s gown for Prom. That was a fantastic choice for a venue to wear a 50’s gown, Kerbey. 🙂 black and strapless and down to the floor! This sounds like a true classic, Kerbey.